In Need of Dealer Direct Financing in Elkhart ? 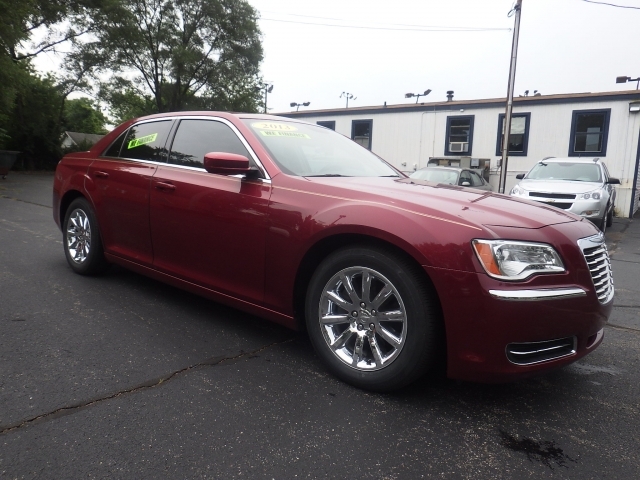 Then Stock# 756772 a 2015 Chrysler 300 4dr Sdn 300S RWD is ready to go with only 25,420 Miles, along with a Ivory Tri-coat Pearl Exterior and a Black Leather Interior. Some of the 300 more desirable features include a Premium Sound System, HID Headlamps, Multi-zone Climate Control, Paddle Shifters, Automatic Climate Control, Keyless Start, Rear Heat / AC, a Navigation System, U-connect Infotainment System, a GPS System, Satellite Radio, Dual Power Seats, a Panoramic Moon Roof, Xenon Headlamps, Keyless Entry, a USB Interface, Premium Beats By Dre System, Heated Seats, Heated Mirrors, a Trailer Brake System, Leather Seats, a Power Tilt/Sliding Sunroof, Push Button Start, Voice Command Features, Steering Wheel Audio Controls, Electronic Stability Control, Aluminum Wheels, Remote Engine Start, Fog Lights, Power Windows, an Onboard Hands-Free Communications System, a Back-Up Camera, a Leather Wrapped Steering Wheel, Brake Assist, an Overhead Console, Steering Wheel Controls, Daytime Running Lights, an Adjustable Lumbar Seat(s), Traction Control, a Power Drivers Seat, a Radar Sensor, a Electronic Messaging Assistance, a Bluetooth Cell Phone Hookup, LED Headlights, Rear Wheel Drive, Steering Wheel Cruise Control, an Anti Theft System, Power Mirrors, Power Locks, an Auxiliary Audio Input, a Compass, a Multi-Information Display, an Auxiliary Power Outlet, Disc Brakes, Anti-Lock Brakes, Cruise Control, Dual Air Bags, a Garage Door Opener, an Outside Temperature Gauge, Illuminated Vanity Mirrors, LED Tail Lights, a Power Passenger Seat, an Adjustable Steering Wheel, Cabin Air Filter, an Auto Transmission with Manual Mode, a Sunroof Sunshield, Rear Auxiliary Power Outlet, Bucket Seats, Tinted Glass, a Tire Pressure Monitoring System, an AM/FM Stereo, a Gasoline Engine, Rear Reading Lamps, a Rear Head Air Bag, a Cargo/Bed Lamp, a Pass-Through Rear Seat, Air Conditioning, Digital Instruments, Knee AirBag, Bluetooth Connection, an MP3 Compatible Radio, a Telescoping Wheel, a Front Head Air Bag, a Passenger Air Bag Sensor, an Auto Dimming R/V Mirror, an Auto Headlamp, a Center Console, Child Proof Locks, Intermittent Wipers, a Front Side Air Bags, Adjustable Head Rests, Rear Seat Center Armrest, a Trip Computer, a Rear Window Defroster, a Spare Tire (Small Size), a Digital Clock, a Split Folding Rear Seat, Floor Mats, a Reading Light(s), Power Steering, a Beverage Holder(s), a Center Arm Rest, a Tilt Steering Wheel, Remote Trunk Release, a Trip Odometer, an Inside Hood Release, and a Tachometer along with a Spare Tire (Small Size), a Reading Light(s), a Tilt Steering Wheel, an Inside Hood Release, a Trip Odometer, Remote Trunk Release, a Trip Computer, a Split Folding Rear Seat, a Tachometer, a Digital Clock, a Beverage Holder(s), Floor Mats, a Center Arm Rest, a Rear Window Defroster, and Power Steering.